Teoxane Cosmeceuticals is a Swiss skincare line licensed and distributed by Alphaeon. 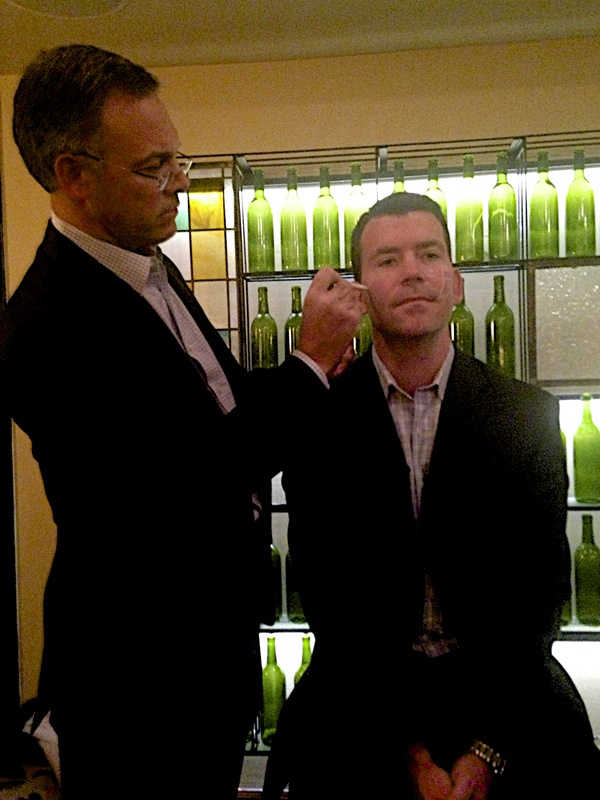 When a good friend of mine began working for Alphaeon, I had my first opportunity to try the RHA Serum. Front and center: RHA Serum. I’m enjoying experimenting with this tall drink of water for the skin during the SUPER-cold Chicago winter weather. 1) The Ingredients: The combo of the patented RHA (Resilient Hyaluronic Acid) with 8 amino acids, 3 antioxidants, 2 minerals, and a vitamin make this a nice concentrate of actives that hydrate and protect. Antioxidants are vital to the defense and preservation of your skin in the barrage of free radical damage we experience by like, leaving the house every day. Ummmm, Time Out: What the heck is Resilient Hyaluronic Acid (RHA), you ask? Teoxane Cosmeceuticals’ skincare line has the same crossed-linked hyaluronic acid used in their dermal-filler injections (Not yet available in the US). The main difference is the patented cross-linking process. A good comparison with a US cross-linked HA filler? It would be like if Juvederm was available for topical use. 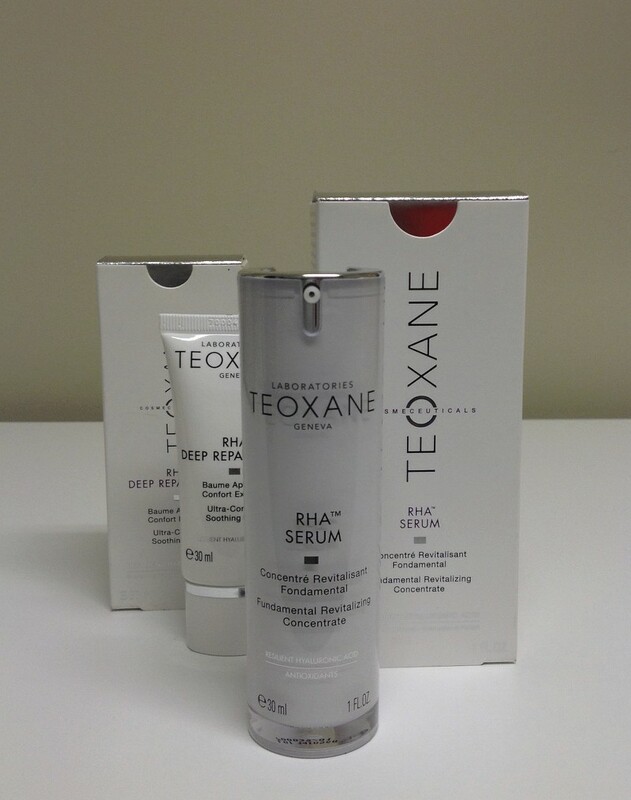 HA is already a popular skin care and dermal filler ingredient for it’s water-loving properties, but Teoxane’s RHA is said to form a mesh on the application zone that allows the active ingredients to gradually be released. Pretty cool concept. 2) The History: TEOXANE Laboratories was established in Geneva in 2003 and has been busy with the design and production of HA based dermal fillers, with products in more than 80 countries. If they know HA that well, I’m going to guess that the quality of the HA ingredient in the topical line is top notch, Oh, and this has got to say something: The RHA technology has been patented now for 10 years! 3) The Feel of it: This paraben free, satin-like serum feels like a gloriously light makeup primer. I was told to use it as one of the last steps in my skincare routine to fully take advantage of the primer-like benefit, but I love how my other products glide on after it’s application. And until next time, stay fabulous, my friends! Allergan Pharmaceuticals’ products (including Botox, Juvederm and Skinmedica, to name a few), their loyalty/partnership programs and their customer service standards are all impeccable. They are truly a class-act company. Even though being acquired by Valeant (or anybody else) does not necessarily mean that these things would change… I think everybody has been sighing with relief after the news that things will be staying put as-is (for now). Until next time, stay fabulous my friends! Erickson Dermatology Opens in Chicago! Here is the blog I am writing for work (Erickson Dermatology in Chicago on Michigan Avenue), thought I’d share the first post! 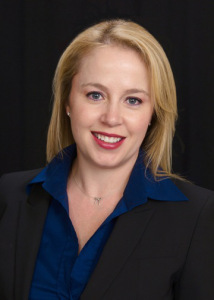 Hi, my name is Elizabeth Weiler, Practice Manager and Aesthetic Director at Erickson Dermatology. I will be one of the contributors to Erickson Dermatology’s blog. 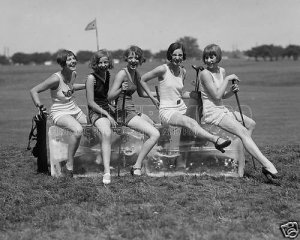 If you are reading this, You are either digging way back in our archives, or you are embarking on this journey with us! So, let’s start with who we are and what we are all about. Dr. Quenby Erickson is a practicing board certified dermatologist. Here she is, the Dermatologist herself! BRRRR! We are still freezing in Chicago, but still smiling because we had a great time at the Allergan Master Class Dinner Program last night! My boss, Chicago Dermatologist Dr. Quenby Erickson and I attended Allergan’s Master Class led by world-renown Brazilian Plastic Surgeon Dr Mauricio De Maio last night in Chicago. He is an intriguing speaker, the BEST, actually! He demonstrated his incredible injection techniques, and showed how he uses Juvederm VOLUMA XC to restore lost volume in different severities of volume loss and laxity. He shared his amazing perspective on genetic aging, lots of advanced facial anatomy, and even told a couple good jokes for some of the most well-known physicians in the midwest. Can’t wait to get back to the office and share everything I learned, especially about VOLUMA XC! Well, if Catherine was around now, she would certainly see the value in VOLUMA, which replaces some of that volume loss with HA, a water-loving material that restores youthful contours… all while you stay low-fat, you fitness buff! What’s VOLUMA? Click here for one of my Blog posts on it, or here to go to their official site. Anyway, I was excited to attend the Allergan Juvederm VOLUMA roundtable dinner in Chicago last week, where we learned more about where to place this (first and only) FDA-approved filler for correcting age-related volume loss in the mid face. Dr James Platis of Chicago presented, and demonstrated just where to place the VOLUMA for the best results. Here he is, mapping it out for us on his gracious and patient demo model. So excited! …Where do I start?? Ok, I’ll start here: Yesterday, Allergan (makers of BOTOX Cosmetic) announced that they have FDA approval for the first filler specifically formulated for the cheeks. 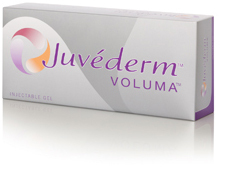 Our new friend’s name is JUVÉDERM® VOLUMA™. This new glorious Hyaluronic Acid (HA) filler is made with Allergan’s proprietary VYCROSS(TM) technology. VYCROSS (TM) is a manufacturing method **cross-linking** that makes this HA super-duper smooth and long-lasting. Another cool fact: Voluma is like the can’t-stop, won’t-stop, marathon-runner of HA fillers: it can last for 2 years with optimal treatment… which is much longer than others. By the way, did you know that HA is a sugar that naturally occurs in the skin? SWEET! Here’s a link to Allergan’s Voluma Page, and here’s one to the Press Release. 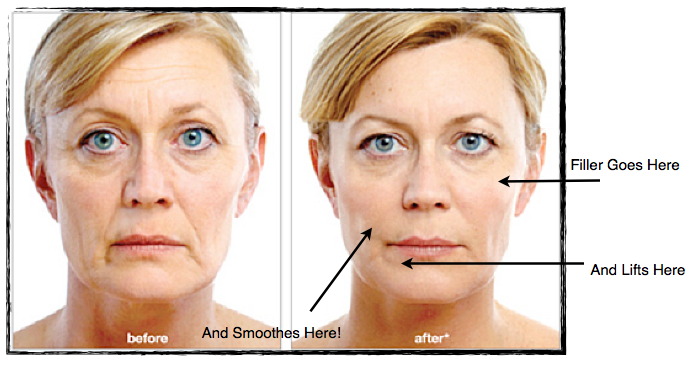 You can also click here to see one of my posts about volume restoration in the aging face. Remember to always talk to your doctor about your candidacy for treatments and give your doc the most updated health history info every time you see them. Pressing a cold pack onto the area for 5 or 10 minutes before your procedure usually means vasoconstriction –so those little blood vessels are running for their lives, not begging to be hit with an injection (this is what causes bruising). BONUS: it helps dull the sensation, too! Icing afterward will also prevent or reduce swelling, which is helpful as well. The cold reduces blood flow to the injury and can limit the size of the bruise. Additionally, the cold will decrease the inflammation (this IS an injury, after all) and reduce any swelling that you might have. So, I think it’d be more helpful on your faces, you guys. Keep in mind that there are always risks to every procedure, so chat it up with your physician to make sure these procedures are appropriate for you… Until Next time: Stay safe, and fabulous! 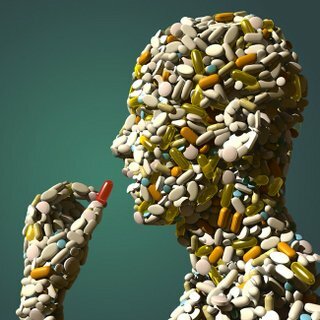 Try to avoid any drugs/supplements known to thin blood for about 5 or 7 days beforehand. However, you should talk to your doctor (don’t just stop because you read a blog!) if you are on those Rx blood thinners, as you’ll want their professional direction about risk vs. benefit. Don’t Pop that (Omega 3) Pill the week before your injection! Keep in mind that there are always risks to every procedure, so chat it up with your physician to make sure these procedures are appropriate for you… Stay safe, and fabulous! When a physician uses a blunt-tipped cannula to administer a soft-tissue filler like Juvederm, Radiesse, Restylane, Perlane or other, they are using a blunt-ended, usually flexible, straw-shaped tool to move around the area. This tool allows the injector to lay little threads of the filler product smoothly and evenly. The key point here is that blunt-tipped micro cannulas are not sharp. When the filler is administered with one, the tissue is not pierced through or poked like it would with a ‘regular’ needle. The physician or nurse will be sliding the cannula in through a tiny pin-point opening that they create (in an inconspicuous place like the corners of the mouth). Then they’ll thread/glide the cannula through the tissue, smoothly filling the area with the product. Additionally, they do not have to pierce through the surface skin multiple times like they would with a needle. This means less possibility of bruising for you! Have a low beauty-tolerance? Micro cannulas could be your new best friend. It’s also less painful, and you’ll typically end up with much less swelling. Here’s a great study from the American Society for Aesthetic Plastic Surgery, if you’d like to check that out. They did a 2 week comparison of post-injection ‘downtime’ of needles and micro-cannulas. They conclude that cannulas are the way to go! 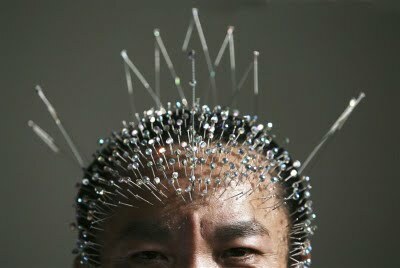 l personally would describe the feeling as “weirdzies” versus “OUCH!!”. You can certainly feel something moving around, which is why I describe it more as a strange sensation, and not really a pain sensation. I’ve personally tried the Dermasculpt Cannula, which seems to be a great product. Dermasculpt cannulas have pretty much become the standard for soft-tissue filler treatment at Cadella Medical Spa and Wellness Center here in Chicago, so it’s the brand I’m most familiar with. Even though blunt-tipped cannulas are a fantastic way to have a soft-tissue filler injected, not all docs use them. They can be much more expensive than regular needles, and training is needed (there is a learning curve, as I understand). It’s also important to know that even if they utilize cannulas for injections in their practice, sometimes an injector will choose to use a traditional needle. It can depend on the product being used, because some fillers are thicker or thinner than others. It also depends on and what the injector wants to do with it, and where they’d like to put it, so it won’t be appropriate all the time. Chat it out with your injector to see if you’re a good candidate for blunt tipped micro cannulas at your next treatment. Check out my other post on Dermasculpt and uplift filler technique here, and until next time: stay fabulous my friends! 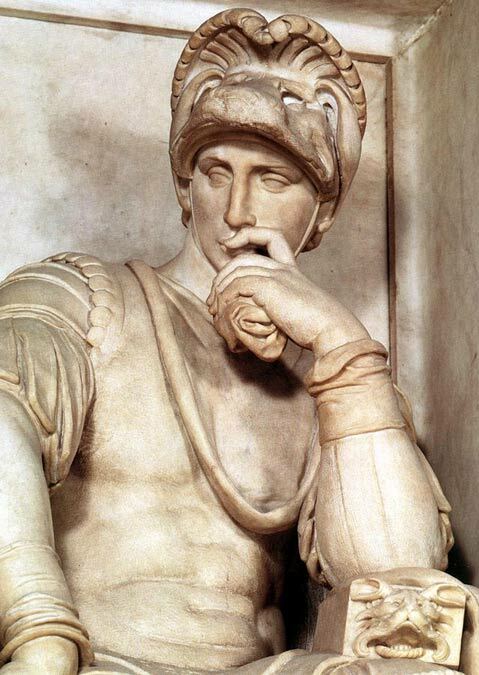 Michelangelo Buonarroti is known to have described his sculpting as a process where he would ‘release’ a figure from the block of stone in which it slumbered. The masters of the Renaissance (and contemporary sculptors, too) would often create a model of their ideal figure first. Typically made out of clay, the artist would mold and manipulate the shapes to take form- and create something beautiful. To me, this is not unlike the soft-tissue filler sculpting methods of today. Injectors will often use combinations of Artefill, Juvederm, Radiesse, Perlane, Belotaro, and/or Restylane to fill in areas that have lost facial volume due to age, injury, or medication/treatment. After the product is administered, they’ll sometimes use their hands to manipulate the material and sculpt the filler inside the tissue, (no, it doesn’t hurt!) since at this point, the fillers have a clay-like consistency. It absolutely makes me think of sculpting, like the masters of the Renaissance. 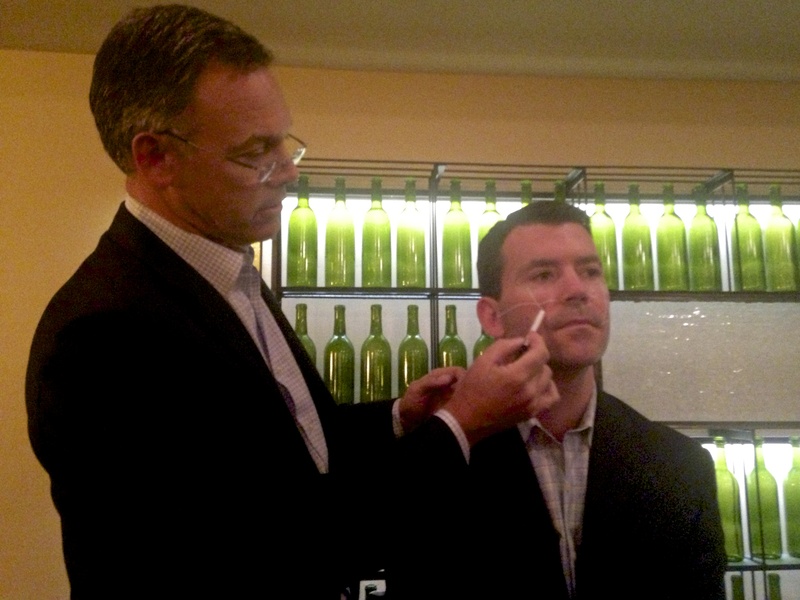 I’ve got soft-tissue fillers on my mind since the fabulous injectable event that I worked last night. We were SO busy, because once you’ve discovered who to go to for a gentle, natural liquid facelift -or- uplift injection, you don’t need to look any farther. Dr. Eliza Parker in Chicago is that physician (and a sort of Michelangelo) for many people. She is a MASTER with the soft tissue filler sculpting techniques and the use of Dermasculpt blunt-tipped micro cannulas. 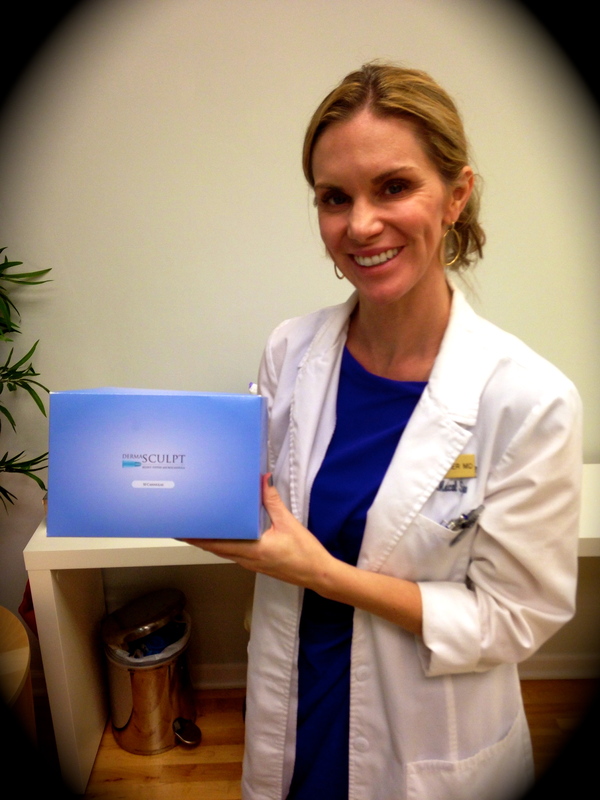 She uses the Dermasculpt cannula instead of a traditional needle, and smoothly threads filler into the tissue. She’ll do this as a part of her sculpting technique as her tool to restore lost volume and build a sort of scaffolding, which helps create a structure underneath any lax or sagging facial skin. 911! Somebody get me some filler, stat!! As we lose the adipose (fat) tissue in the upper face, we’ll see sagging in the lower face. If you’re in the Chicago-area, I would highly recommend seeing Dr. Eliza Parker for a consultation: her technique is total artistry. She even trains other medical professionals how inject with these special cannulas. Here’s Dr Parker’s website, so you can check it out! Dr Eliza Parker: the Dermasculptor, and her tools of the trade. And if you happen to be in Florida, you could certainly give Dr Pierone a call. Dermasculpt seems to be having trouble with their physician-finder page as I write this, so if you’re in any other of the 48 states… (sorry!) check back with them soon to find an MD in your area: Here’s the Dermasculpt link for you, and until next time: stay fabulous, my friends! 3 Fast Facts THIS could be your new Fave! Things that make you go "HMMMM!"